Creative industries in the Greater Concord area are flourishing and the Capital region is emerging as New Hampshire's cultural center. Through the Chamber's Creative Concord Committee, arts, business and community leaders have joined forces to study and measure the creative economy in our region, and create a long-range, strategic plan and strategies to build and maximize the creative capital of the Greater Concord region. 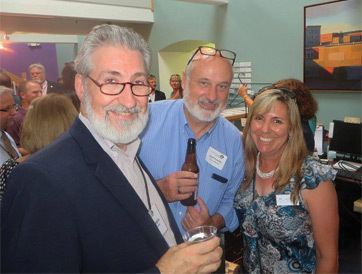 To celebrate Concord’s newly revitalized downtown, the committee hosted Capital Arts Fest in May of 2017. The day-long festival showcased the Capital Region as an arts and cultural destination, with more than 20 complimentary cultural events, including live art and craft demonstrations, musical and theatrical performances, historic walking tours and more happening throughout the day and the Greater Concord community. Visitors who turned the corner at Capital Plaza looked up to see hundreds of colorful umbrellas playfully hanging overhead and reflected in puddles and neighboring office windows. Kimball Jenkins School of Art in collaboration with artist Pam Tarbell rolled out its Big Bicycle Project — bicycle-themed sculptures created by community members installed along Main Street for all to enjoy. And internationally-renowned rock opera theatrical performance group Squonk Opera traveled from Philadelphia to headline the day's festivities, performing its newest Cycle Sonic act twice at Capital Plaza on Main Street. Press coverage leading up to the Capital Arts Fest included the Boston Globe . Art continues to spring up around the city. In October, Kimball Jenkins School of Art installed a 36' tall mural on the historic Ralph Pill Building. It's visible from I-93 at Exit 14 to the delight of passersby and the local teens who made it. The mural isn't the first public art installation created by young artists that's having an impact on the community. In 2016, Kimball Jenkins unveiled the 24' Haley Rae Martin Mural off Main Street adjacent to Phenix Hall. Greater Concord is one of four area nonprofit arts and cultural institutions that recently participated in the 2017 Arts & Economic Prosperity Survey, organized nationally every five years by the Washington D.C.-based nonprofit Americans for the Arts . The study measures the direct economic impact of the institutions and audience spending, which represent only a percentage of the overall creative economy impact. Multipliers such as spending on hotels, restaurants, shopping, etc., are not factored in. The numbers are impressive and support what Creative Concord, the Chamber's standing committee to advance the creative economy, already knew — the creative sector is one of the fastest-growing segments of our local and regional economy. Not surprising when you consider all of the arts and cultural institutions in the Capital Region, and combine that with all the for profit businesses that use artistic creativity to produce products and services, including graphic and web designers, photographers, architects, writers, etc. The 2017 Arts & Economic Prosperity Study reported that total industry expenditures amounted to nearly $31.2 million dollars annually in the Greater Concord region alone — an increase of $13.5 million from the previous study . This new figure is very conservative considering that the entire for-profit creative sector and the ripple effect of local spending were not included. Nonprofit cultural institutions in Greater Concord support more than 950 jobs , generating $22.4 million in household income to local residents. The annual impact to local and state government revenue is $2.8 million . Summary of the 2017 Arts & Economic Prosperity Survey on Greater Concord (link to the full study above). CLICK HERE to see some ideas to update Concord's image to the world and read Greater Concord Chamber of Commerce President Tim Sink's "The next big thing" blog , where he advocates that redeveloping Concord's untapped opportunity corridor, I-93 through Bow and Concord, would be one of the most transformative actions city leaders can take to showcase a destination city and welcome visitors. 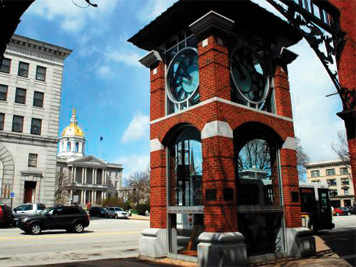 Perform live in downtown Concord at one of four locations! Here's the latest information on busking . Are you an artist interested in downtown housing? CATCH Neighborhood Housing's Mennino Place is an affordable rental community with a preference for artists. Click HERE for the application. Concord City Auditorium, "The Audi"
Check out the Concord Community Music School's video made possible by Heartwood Media's Nonprofit Challenge! Gallery at Concord City Auditorium, "The Audi"
Concord is a fantastic place to enjoy bands and local performers! Get a detailed list of venues that host live music on our Music, Arts and Culture web page . Residents from other countries gather once a year at Concord's Multicultural Festival to celebrate their native cultures through music, dance, food, crafts, storytelling and and other interactive and engaging exhibits. Intown Concord's three-day, summer street festival is free fun for all ages! Head Downtown to enjoy street vendors, local food, live performances, kids activities, craft beer tent, exhibitors and more . The SNOB (Somewhat North of Boston) Film Festival showcases and supports independent filmmaking. It strives to bring films to the area that local audiences might not otherwise see in a relaxed, fun environment. Looking for scenic film locations with close proximity to Boston? New Hampshire has it all . www.yourconcordtv.org Watch the latest "Arts in Focus" program for an interesting and entertaining look at how the arts are thriving in Concord! Plymouth State University's undergraduate programs in studio art, graphic design, music and theatre, and graduate programs in art education. Check back often for page updates!